As parents we work very hard to make certain that our children learn to organize their lives in a proper manner. It is called executive functioning. Being able to arrange your life so that you can function on a healthy adult level is part and parcel of becoming independent. Knowing what to do when, and how to accomplish your goal, is a major aspect of navigating the world. 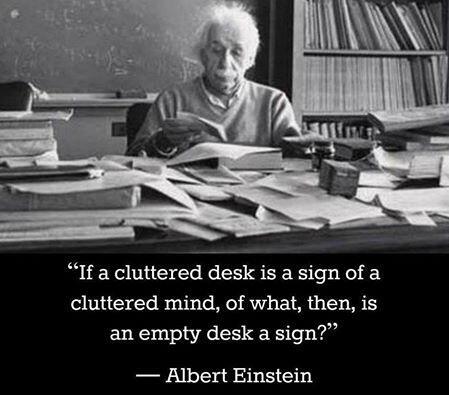 If you can't keep a neat desk how are you going to function in life? Right? Well....not so fast. Honestly if you look at the boys' desks you would think that we have basically lost this battle. But then again what is inside someone else's mind and what helps them function is not necessarily clear to everyone else. I would say that at times the phrase, "to each his own," becomes very telling about individual realities. Anyway, it's just a thought. Not an excuse nor an acceptance of failure. But just a notion about executive functioning and the question of whether it really means the same thing for every person. There may be basic characteristics of executive functioning that we need to teach our children, but in the end they have to develop their own sense of comfort with the world around them, don't they? By the way we haven't given up on organization. There are still schedules and charts that help everyone know what to do when from homework, to chores, to exercise routines. Calendars and to do lists are important. But you can bet that the last place I touch is their desks. Besides only heaven knows what anyone will find under all those piles. You can be assured that if there is something nasty growing under all that flotsam that the boys created, THEY are the ones who are going to deal with that fallout and not me. Listen, the boys know what they need to do and where their work happens to be. Its their individual filing systems. Not gonna mess with that arrangement....hey it's worked so far and if it ain't broke I say don't fix it until it needs fixing.